Courtesy of News-Press - If you’re the parent of a young athlete, listen up. You think your child is healthy. Ten fingers. Ten toes. They grow taller and run and jump and swim. They look every bit the picture of good health. But some very serious problems can lurk under the surface. 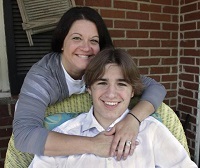 Courtesy of Columbus Ledger-Enquirer - This seemingly healthy 16-year-old sophomore suffered cardiac arrest, stopped breathing and had no pulse. Courtesy of Daily Star - The British Heart Foundation (BHF) has revealed 620,000 people in the UK could be at risk of sudden death. Courtesy of The Journal - Seven in 10 cardiac arrests happen in people’s homes, meaning a loved one or friend doing CPR is often a person’s best chance of survival. Courtesy of Mmegi Online - Top cardiologist, Professor Kiran Bhagat says cardiac arrest can be prevented if sport codes conduct regular medicals for their athletes. Courtesy of Care 2 - Sudden cardiac death is the first manifestation of heart disease for the majority of individuals, particularly among women, meaning they had no idea they even had heart disease until they were literally dying from it. 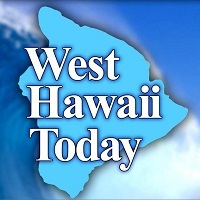 Courtesy of West Hawaii Today - More than 50 emergency response personnel statewide traveled to Hilo this week, seeking to boost survival rates for people with sudden cardiac arrest. Courtesy of Consumer Affairs - High amounts of sugar and caffeine can aggravate underlying heart issues, causing fatal arrhythmias. Courtesy of Independent - A mum who suffered a cardiac arrest when she was teenager has spoken about family life with her children, who inherited the same hereditary heart condition. 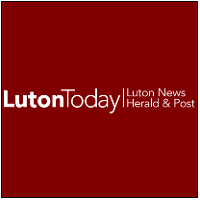 Courtesy of Luton Today - A ten-year-old, quick-thinking youngster from Luton saved his mum’s life just a week after learning first aid skills at his Cub meeting. Courtesy of Mass Live - Two years ago in February, Kathryn Henry was walking to her next class at Tantasqua Regional Junior High School when she collapsed in the stairwell. Courtesy of ABC Action News - A child's heart condition can have bigger importance for a whole family if it's a defect that's inherited. 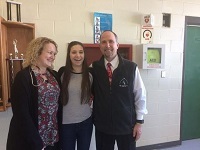 Courtesy of Main Line Times - In February of last year, Annie FitzPatrick, 20, of Merion nearly died after suffering sudden cardiac arrest in the parking lot of a Wawa in Penn Valley. Courtesy of CTV News - Consuming too much salt is having a negative effect on teenager's health, and could possibly lead to cardiovascular disease in adulthood. 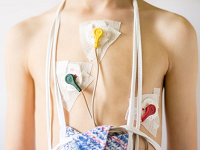 Courtesy of Cardiology Advisor - The risk of sudden cardiac death (SCD)/ventricular arrhythmias is considerably higher in patients with atrial fibrillation (AF) compared with patients without AF, according to data recently published in Nature's Scientific Reports. Courtesy of The Herald - It’s not every day you hear a story starting with “when I died,” but that’s how 22-year-old Amber Moloney remembers Feb. 6. Courtesy of ABC Online - Darryl Madder was putting his feet up after a hard day of work at his Cairns nursery one day two-and-a-half years ago, when suddenly everything went dark. 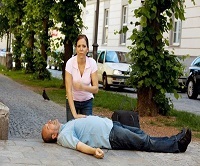 Courtesy of NewsMax Health - When someone goes into cardiac arrest, quick action from bystanders can have a long-lasting impact, researchers say. 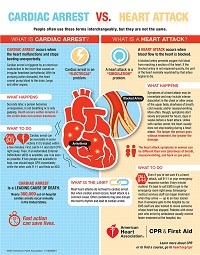 Courtesy of Science Daily - Sudden cardiac death resulting from fibrillation -- erratic heartbeat due to electrical instability -- is one of the leading causes of death in the United States. Courtesy of CapeCod.com News - When it comes to heart disease, understanding the differences between heart attack, cardiac arrest and heart failure isn’t easy.